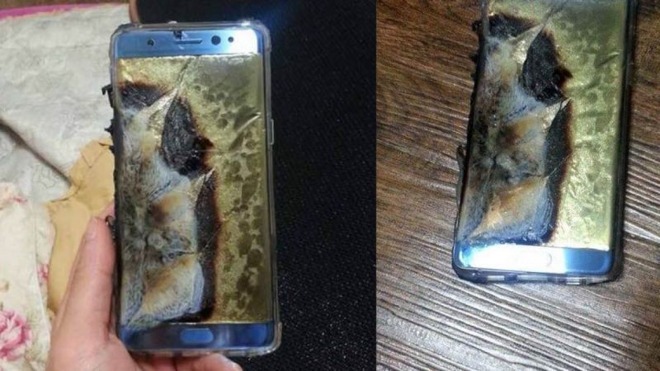 After multiple reports of the Samsung Galaxy Note 7 battery exploding during charging, the company has delayed rollout of the new "phablet" in undisclosed markets for additional quality control testing. The delay is in response to a flurry of reports on South Korea social media showing destroyed phones as a result of an "explosion" from the battery. The Samsung statement to Reuters on the matter is terse, saying only that "shipments of the Galaxy Note 7 are being delayed due to additional tests being conducted for product quality." Not known is what markets are affected by the delay, or how long the shipment hold will last. The U.S. and international models have slightly different hardware configurations, but identical batteries. Initial reports on South Korea social media may point to non-Samsung USB 3 type-C cabling as the culprit. Apple has seen similar problems with faulty third-party charging accessories in the past, and a Google engineer has spent a great deal of time exposing bad USB-C products for similar reasons. The Galaxy Note 7 was announced on Aug. 2 and started shipping to U.S. customers on Aug. 19. AT&T is currently listing short delays for the device, with a unit ordered on Aug. 31 shipping between Sept. 6 and Sept. 8. T-Mobile has similar shipment windows. Amazon is showing no hold-ups in shipping, but a similar customer receipt window. The battery failures aren't the first issues identified by users of the Galaxy Note 7. Reviewers and YouTube examiners have noted that the Gorilla Glass 5 used for the screen of the device is significantly more susceptible to screen scratches than other smartphones, iPhone 6 included. Gorilla Glass manufacturer Corning disagreed with the scratch test results, and called screen damage induced by testers making an effectively permanent "material transfer" from the testing apparatus to the screen. The earlier Galaxy S6 edge phone with a curved display had significant production problems, leading to lower than expected sales. Any quality problem, even one resolved quickly, with the Galaxy Note 7 is likely to have impacts on sales, especially with the "iPhone 7" unveil event imminent. AppleInsider has reached out to Samsung for further comment on the matter, as well for details on impacted markets and expected resumption of shipments.